Image caption Could this be the kind of airliner we're flying in, by 2050? The drive to increase fuel efficiency and improve the aerodynamic performance of new aircraft is leading designers to move away from using aluminium in airframes. Instead today's latest planes like Boeing's 787 Dreamliner and Airbus's A350 rely on lightweight carbon fibre composites - woven mats of carbon which are embedded in plastic. The key to a composite material like carbon fibre is that it is incredibly strong for its weight. "You have carbon fibres mixed into a matrix," says Manchester University lecturer Aravind Vijayaraghavan. "Normally the matrix is a type of plastic, which is not very strong, but if you mix in carbon fibre then it takes on the strength of carbon fibre and becomes strong." In the UK, European aircraft manufacturer Airbus has been working with Britain's National Composites Centre into research and modelling of new industrial designs and materials. "This is a component that takes the full load of those forces as you're travelling through the air at about 250mph - and you can lift it yourself," says Colin Sirett, head of research for Airbus in the UK. "We could get a sledgehammer and take it to this panel and the sledgehammer would actually bounce off," he told BBC World Service's Business Daily programme. Composites mean that manufacturers can get a good surface finish on components to optimise their aerodynamic performance. Using these kinds of materials is also opening up other potential savings. An A380 super-jumbo, for instance, has about six million parts - but in future this could be cut considerably. "We will mould all the parts together at the same time, so our perception of what a single part is will change," says Mr Sirett. With fewer components, manufacturing time also will shorten, saving money. Crucially for aircraft manufacturers, carbon fibre components are lighter than similar parts made of aluminium. "If we can take a kilogramme of weight out, that's got a huge saving over the life of an aircraft," says Mr Sirett. Each kilogramme cut means a saving of roughly $1m (£603,000) in costs over the lifetime of an aircraft, he calculates - and the use of such composites can reduce the weight of an aircraft by up to 20%. BBC World Service's Business Daily goes back to basics and examines key chemical elements - and asks what they mean for the global economy. Of course, since the mid-1970s civil airliners have had some carbon fibre in their airframes. Currently, Boeing's latest plane, the 787 Dreamliner uses composites for half of its airframe including the fuselage and wing, while Airbus's A350 XWB has both its fuselage and wings made of carbon fibre. While the use of carbon fibre has allowed the creation of sweeping wing tips, which can cut fuel consumption by up to 5%, both aircraft are still fairly conventionally shaped. Yet, the great advantage of using carbon fibre as opposed to traditional metal is that it gives designers much more freedom when trying to juggle the conflicting demands of aerodynamic efficiency, fuel savings and reducing engine noise. 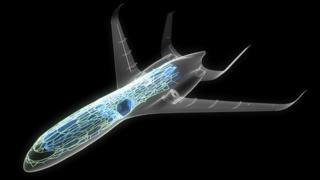 So, the airliners of the future are likely to be radically different. Such shapes could include blended wing designs, where the fuselage and wings merge into each other - like some military aircraft today. Such a design could significantly improve a plane's lift-to-drag ratio - making it much more aerodynamically efficient, and also reduce its overall weight. Airbus recently unveiled its own proposals for an airliner of the future - and it too moves away from the traditional narrow tube-like fuselage. Instead, its 2050 concept plane has a fatter fuselage, which is curved and shaped to improve airflow and to provide more internal space. Its wings are longer and slimmer to reduce drag and save on fuel. The tail section is U-shaped, which acts as a shield, cutting down on engine noise. The engines themselves will have become more reliable, so ground crew will need to access them less frequently for maintenance. This means they can be partially embedded in the airframe to improve fuel consumption. Futuristic concepts like this may never quite get off the drawing board, but elements of it are certain to be incorporated in all future aircraft designs, in large part due to the materials revolution which is rapidly changing all aspects of manufacturing. Listen to Business Daily on how carbon is being fashioned into new forms that could reshape our world.